Using the latest in Pure water technology, your conservatory can be cleaned from top to bottom in no time. 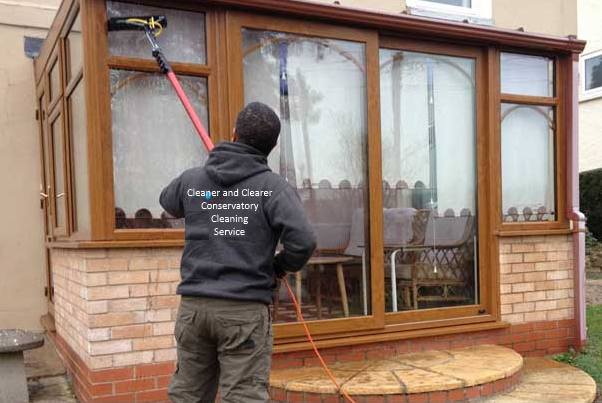 Cleaner & Clearer specialise in Conservatory, uPVC Roof line and window cleaning. We are a well established company and offer a professional, fully insured service. We strive for customer satisfaction therefore all of our cleaning services are of a very high standard. Cleaning your conservatory regularly greatly reduces the need for repairs and maintenance. Over time, the accumulation of dirt and grime causes damage such as corrosion, fading and discolouration. You’ve spent a lot of money on your conservatory, why not look after it? A clean conservatory really can make all the difference to your house, so make sure your conservatory is clean in time for the spring and summer months when you will be making the most of your conservatory. We also clean patios and driveways. Why not call and get a discount when ordering 2 services.